Today I am sharing with you part of my soul. But this, today…this is a sacred part of my heart. A part that I do not share with very many people, because for me it is quite intimate. I’m sharing with you my voice. I was recently asked what to say to someone who is in the throes of the anorexia. And this is a hard question. Because when you’re in the midst of the disease, as with any addiction, it is all consuming. Quite literally. You’ve gotten yourself so engulfed in the rituals surrounding food, the rules for yourself, the obscene exercise, the lies you’ve spun, the isolation and pushing people away, the obsession over food, the self-punishment, the avoidance of social situations, the explosive blow ups with family members — in short, you are not you any more. That’s what makes anorexia so hard to break free from. You become a shell of your former self. A shell that doesn’t feel. Doesn’t love. Doesn’t care about any thing or any one, other than ED. So. Back to the question? How does one break free? What do you say to someone who is in the throes? First and foremost, it’s all about Jesus. And conceptually, we know that. But what does that actually look like? How does one go about that? 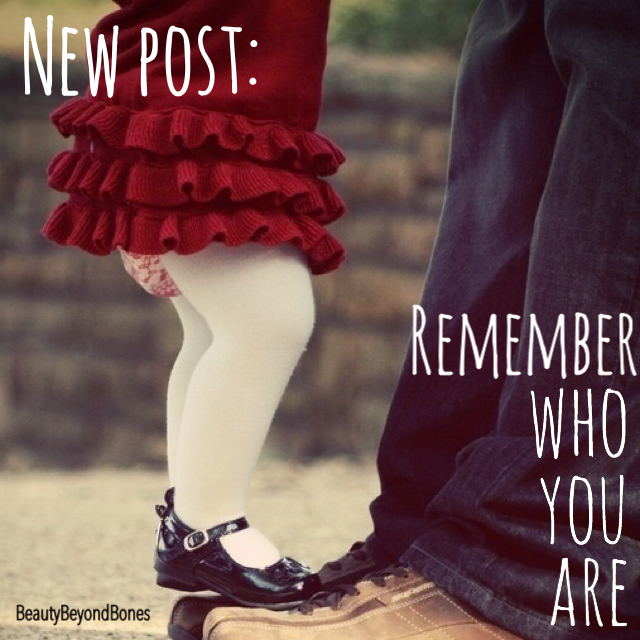 The answer: Remembering who you are. Finding a key that links you back to who you were before your disease. Like a pin-prick in a piece of black construction paper that can let a tiny beam of light in. That’s all it takes. A tiny little pin-point of light can begin to shatter the hard, exterior walls ED has built. For me, it was singing. Ever since I was a child, I have been a singer. In musicals, in choirs, into the hair brush to the bathroom mirror. I loved singing. I remember telling people that I feel most alive when I am on stage singing. That there is a part of my spirit which can only be tapped into when I am singing. And when I was in my anorexia, that part of me was suppressed. It died. I didn’t sing. Didn’t listen to music. Didn’t even really use my voice at all except during fights with loved ones over intake or inpatient or my future. And it wasn’t until I got to inpatient, where we had chapel every single day with praise and worship music, that I began to use my voice again. I began to sing. And it was singing those songs about Jesus and how much He loves us, and using my voice, that I slowly began to remember who I was. My voice was the “horcrux” ((Harry Potter geek!!)) that enabled the lifeless, soulless, ED-controlled me to get a teeny-tiny glimpse of the “old” me. The me that was free from the tortured reality of anorexia. The me that loved other people, and loved myself, and found joy in life and joy in bringing light to other people. It brought me out of the darkness and began to chip away at the walls I had built. The episode in particular, was the song, “Here I am to Worship” and the line was “I’ll never know how much it cost to see my sin upon that cross.” To see my eating disorder upon that cross. To see my lying and manipulation and rage and hurtful remarks yelled in anger — my anorexia — was on the cross. Jesus died to forgive me of that. To take it away because He loves me. And He loves you too. All those things are on the cross for you as well. After I sang those lyrics, I smiled for the first time in a year and a half. Literally. I genuinely smiled. And did a sort of laugh-cry, because I knew I was forgiven, and it was the “old me” reentering my ED-possessed body. 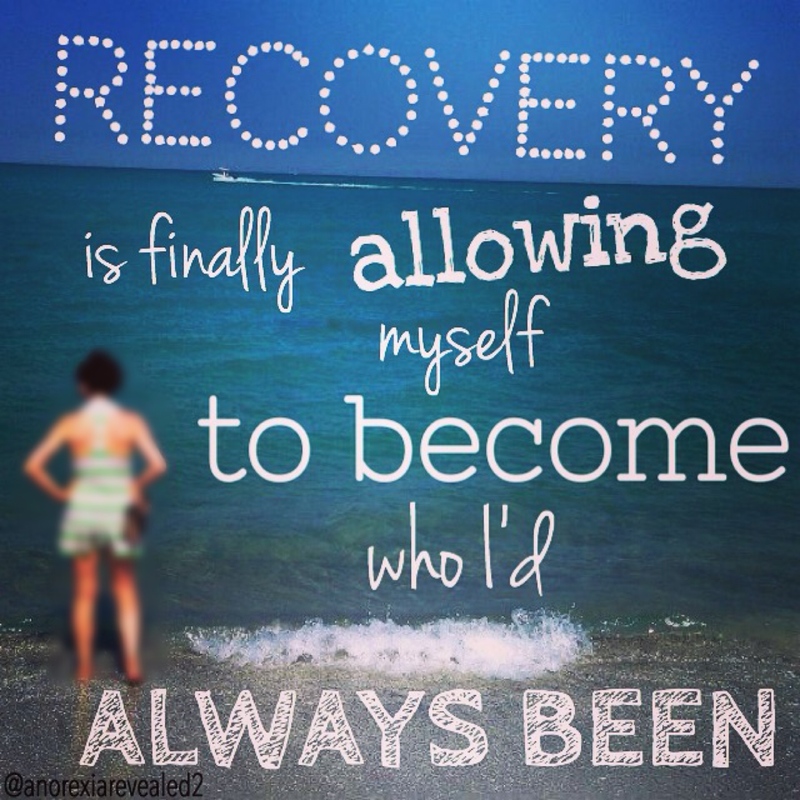 That’s when things changed and I truly embraced recovery. Embraced life. Embraced me. So now, it is with great nervousness, that I share with you my voice. It is a cover of the song, “I Shall Not Want” by Audry Assad, who I look up to so much. I know it is cheesy, but I try to sing at least two or three times a week, just to myself in my apartment, as a way to stay connected with my “old” self. And if I’m being honest, when I am singing is when I feel closest to God. It is my form of prayer and worship. I invite you to just read the lyrics if you don’t want to listen. This song reminds me that in Jesus, there is nothing that I should want for. No worries about body image, or weight, or having the perfect this or that, or any other burden that is pressing on my spirit. Jesus frees me from all those anxieties. And He will for you too. Next Post Where’s the Line? God says well done my good and faithful servant. Keep letting Him use you! Thank you so much Pam. Yes me too. So so so incredibly glad. God is good, that’s all I’ve got to say! The word ‘soul’ is psyche in Greek. It quite literally means ‘mind’. In the Bible riches are truths and all things are measured by worth. So then ask yourself ‘ Where does my worth lie? In the value of things that fill the hungers of storehouse of the soul, our in the selling of your treasures to purchase empty things?’ The selling of your soul to the devil is the trading away the goodness of your understanding for an illusion of control. One can not serve both morality and control. So I am pleased that you have found the light of truth and understanding and saved your soul/mind from the prison of darkness called ignorance believing in the illusion of control. Thank you for sharing your trust riches and making the world a more worthy place to live. friend!! i have deleted my blog… because at the moment the job i have its not such a wise decision to have one… but i am still following the blog’s i subscribed to. This is probably very public.. but then so is your blog… i recently moved to a new place and it has been really lonely out here, just kind of lost in my own thought’s and just what’s going on around me, surprisingly as same as you i like to sing but i also sing sad song’s when im feeling sad…. and that’s literally what i have been doing… also looking for someone to fill that void… cause its just so lonely!!. i heard your voice and it made me feel better!! you sing really well. I’m praying for you that God will reveal Himself to you and fill the void you are experiencing through this new season in your life, and that you will find a reason to sing happy songs again!! Thanks Kim:) I really appreciate that! Have a wonderful morning! awww thanks!! i appreciate it!! WOW! Thank you for sharing – what a blessing you are! Your visit to my blog was no mistake. I have a friend I am trying to help. I can see how much pain she is in, and I feel terribly inadequate to help her. I am humbled that she even shared with me her struggle with ED. I have been praying for God to help me and give me wisdom to understand her struggles…then I found your site. Thank you and GOD BLESS YOU! Thank you so much, Pastor Jim. It is my prayer that you and she can find some comfort here. ED is a robber that comes to steal, kill and destroy. Jesus is the way out. May your friend come to find her worth in Him. That is the ticket. 🙂 Thank you for your encouragement! Beautiful….May your voice always transfer the joy of the Lord from his heart to yours . May your voice to transport strength, hope, healing and upliftment the ears of hearts of those God will put in your path. Thank you so much Evee. That is my prayer as well 🙂 thanks for stopping by! I love your voice! I released my first song “Rise Up Children”….I’m using what I have…not because I think I’m all that . ..but using what I have as a messenger of hope. Even in our struggles we can strengthen others. Keep sharing your voice. It is a precious authentic offering. Thanks for sharing Jesus in such an honest, personal, natural way:) Peace dear one! I have never struggled with an ED, but I own a transcription company and have an ED center as one of my clients. While my J.O.B. is transcribing, because I am a Christian, I feel that my real job is to pray for those persons whose lives I get to see a little glimpse into. Admittedly, because this disease seems so daunting, I have found myself praying less and less for these souls, so first, thank you for sharing your story, it has given me a renewed hope to continue praying because the Lord DOES hear, and you are evidence that this struggle can be overcome, not through man’s means, but through God’s means! While I do not know you, I am proud of you for not only sharing your triumphant story, but for sharing your beautiful voice with those who come across your blog. I am thankful for your heart that says despite the possibility of being rejected, I am laying it out there for the world to see because you understand that God can and is using your story uniquely for HIS purpose and to His glory! God bless you!! You have a beautiful voice in your blog. You speak Jesus and his love, redemption and healing. Keep writing and singing! It is hard to bare your soul to the world. I commend you for doing that. I know you can help those who are going through the trails and tribulations of anorexia. You have a very lovely, calming voice. And yes the answer to everything is Jesus. Praise and Worship music helps me everyday too. We are all wounded and need to place ourselves in the loving arms of Jesus.Continue my dear child in courage and fortitude you are running the race well and it seems that many are following you, along the right path. Thank you for sharing your soul for it is lovely to behold!!! Wow thank you so much. I am humbled by your words. God is so good and Jesus’s arms are definitely the place to be! 😊 thanks for stopping by! I love Francesca Battistelli too. So beautiful!! Holy Spirit you are welcome here, come flood this place and fill the atmosphere!!! Thanks for this insight! I appreciate your encouragement friend! Have a great day! Hugs! you too! It’s hard to protect our hearts sometimes when we are vulnerable but it is very satisfying when we open up and people accept us for who we are! I’m really drawn in here. When you said you were going to sing, I had a gut feeling your voice would be gentle, and set my heart at the feet of Christ. So I was right. Thank you sweet friend. Yes there’s something about singing that really releases your soul and frees your spirit! Cheesy but true! So glad you’ve found an outlet for singing! Thanks for stopping by ☺️ hugs! Thank you koko. That’s very kind of you to say! Thanks for stopping by! You’re Welcome ! You’re very inspiring and relatable. Thank you! Hi, dear one. Thank you for visiting me. I’ve listened to your song and read a bunch of your posts, too. What a lovely voice! Maybe you might consider posting a daily song of praise on your site? Hearing your voice each day would be a huge blessing. Meanwhile, many blessings to you; praising God for meet you. Oh my gosh GerorgetownRose, how kind of you to say! I will definitely prayerfully consider that:) thank for you stopping by and listening and reading and just for being a bright spot of encouragement. Blessings to you! Thank you for your comment 😊glad you stopped by! Glad you found your (spiritual) horcrux! You have a lovely voice. Thank you so much. Isn’t it amazing the way songs have he ability to touch our heart in such a powerful and specific way! Thanks for stopping by! Thank you so much:) glad you stopped by! Thank you for sharing this with us! I believe it serves us all well to remember who we are, as we all get lost in some form or fashion as we go through this journey called life. Even if there is a point where we just cannot even fathom who we are anymore, we can always remember whose we are. Oh my goodness, look at all these comments. God is good. This surely came through you from Him. Where did you go inpatient? May God continue to bless you exceedingly abundantly, dear sister! Jesus is absolutely beautiful in/on/through you! Love the name “beautybeyondbones”! I absolutely LOVED it! I left a message for you on Soundcloud. What a powerful testimony. Thank you for having enough courage to share this. Praise God for what He has done in you and through you. Praise God for you! Had to listen to it a couple times. When I listen to your voice, it just reminds me of how simply beautiful God is, and what mighty work he can accomplish. Truly, none among has can even comprehend his scale. Thank you for sharing your gift! May you find blessing from it! And please do check out my blog as well! There is freedom in the name of Jesus! Like you, I found freedom from a deadly ED when I realized my identity in Jesus! When I realized who I was, God’s child, created perfectly and beautifully, I was able to break the chains of anorexia and bulimia. It’s very encouraging to read about someone else who found their freedom through Jesus! Keep singing for Him! Thank you so much:) I am so glad that you have found freedom as well! Praise be to God! And yes you are a beautiful creation! Thanks for stopping by! That’s a beautiful piece of writing. Thank you! As you heal, thank you for pointing others along the way to the source of your healing! Very amazing post. I will be looking to you for inspiration! Thank you! When I saw your post title I was so happy. And then to hear your beautiful singing it was even better! You see, as part of my story I’ve been writing, I came up with a theme song to encompass what it’s all about. That song just so happens to be titled ‘Remember Who You Are’! I have already recorded it, but want to do some revising before posting it. I’d love to share it with you as soon as it’s done. And hey… keep on doing what your doing. Hey Zac! Thanks:) oh my gosh what a coincidence! Yes I’d love to hear it!! Thanks for your thoughtful words! Have an awesome Tuesday! Blessings! Do you use the anorexiarevealed@yahoo.com email address listed on this page? I love the honesty and authenticity in this post. It is so true that the moment we forget who we are most important who we are in Christ we get knocked down by life so hard to a point where we don’t even know how to smile. I too recently went through something similar where i couldn’t even smile, even talking was so hard BUT Jesus healed me of what was bothering me at the time. And like you I love singing and i have been singing and worshiping Him like crazy since then. God bless you and may you continue to walk in the freedom that Christ died for. Thank you so much for the reblog, Br. Andrew:) have a wonderful And blessed Christmas! Beauty, that was …*sigh* I can just lay back, close my eyes and listen to your voice. I’m trying to think of words to say how your voice makes me feel. I’ll just…*sigh* Thank you for putting yourself out here so bravely. It’s…a blessing. Oh my gosh Jeffrey. Thank you:) thank you for being such a great friend and encourager. It means more than you will ever know. His was one of the scariest posts to push publish on. Thanks for being so affirming. Well, I’m just glad to contribute. When I was college instructor and then a corporate trainer, I realized God made me to help others make their lives better. Everyone is always so angry anymore; I just try to compliment sincerely and support honest effort. If you’ve had a chance to check my “Shallow End of the Gene Pool,” part of the summary is how, no matter how much we give, God returns more. The post is the story of my bypass surgery; how it all went down. After commenting with you, I thought it might be a worthwhile thing to share. THANK YOU for inspiring me to write it down! I loved your personal story, would have liked to have listened to you singing, but the cloud sound didn’t work for me – have you got a video on YouTude I could watch? May the Lord Jesus rebuke this disease in Jesus Name! !